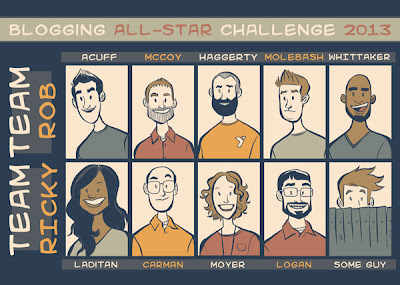 It's time for the 2nd annual Blogging All-Star Challenge, where Rob Shepherd and I each pick a team of bloggers and go head-to-head. Check out my team for 2013, and then go vote for them! Bryan Logan is a computer programmer by day and a computer programmer by night (seriously, he doesn't forget all that stuff when he goes home). He's also a husband and father to 3 kids (again, both day and night). Bryan, along with his wife, write a blog called "The Logan's". Don't worry, the creativity is focused on the content. We write about all sorts of things. Some critics may say our blog lacks focus, but we like to point out it gives us the freedom to blog about random topics without the awkward segue. Speaking of awesome Twitter accounts, you can follow Bryan at @BryanMarkLogan. Bunmi Laditan is a regular contributor to Parenting.com, Mothering.com, iVillage.com, and The Huffington Post. She lives with her family outside of Montreal. She writes for her personal blog as well as The Honest Toddler blog and Twitter account. She recently published The Honest Toddler: A Child's Guide to Parenting. Some Guy lives in some town with Some Wife and Some Kids. He is best known for his guest posts on Jon Acuff's Stuff Christians Like, which makes for a slightly awkward competition since Jon is on the other team. During the day, Some Guy works as an engineer at some company, and he spends his nights putting kids to bed, back in bed, and back in bed again. His hobbies include running, predicting the outcomes of football games (not necessarily correctly), and translating the Bible into Facebook format. Jan Moyer loves teaching kindergarten. She has four boys and wants to make it clear she and her bearded hubby weren't "going for a girl". She love M&Ms and goldfish, but not together. Coffee is almost her security blanket - never out of reach. She's passionate about making learning fun (at school or church). Her blog is called Tough Bananas. C'est tout! Daniel Carman views himself as a meglomaniac in the mold of The Brain, yet too often confuses himself with quadratic imponderables. He would like to think his blog style is a cross between C.S. Lewis and Dave Barry, yet small children mock his writing, often pointing and laughing at him mercilessly. He is the father of a wonderful daughter who is working with him to both reduce the number of adjectives that he uses in everyday conversation, as well as to get him to stop his incessant whining.